Many events in the history of mankind eventually fade into oblivion, but others, leave their indelible marks for the entire world to see. More than 350 years ago, the Croats initiated one such influential occurrence. Although started in the 17th century in a small region on the Adriatic coast, the consequences of this event are still very much evident the world over. 600 million people now wear the ubiquitous symbol of Croatia around their necks, close to their hearts. In his book, La Grande Histoire de la Cravate (Flamarion, Paris, 1994), François Chaille tells us about the appearance of this article of clothing and how it became fashionable. For the gallant French officers in the thirty-year war, the advantage of the Croatian neck scarf was its enviable practicality. In contrast to the lace collar that had to be kept white and carefully starched, the scarf was simply and loosely tied around the neck without need for any additional care. Just as elegant as the stiff, high collars, the new scarves were less awkward, easier to wear and remained visible beneath the soldiers’ thick, long hair. Around the year 1650, during the reign of Louis XIV, the Croatian scarf was accepted in France, above all in court, where military ornaments were much admired. The fashionable expression, ’a la croate’, soon evolved into a new French word, which still exists today: la cravate. This innovation symbolized the height of culture and elegance. On his return to England from exile, Charles II brought with him this new word in fashion. 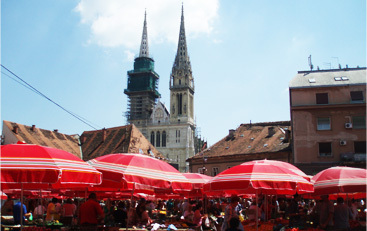 Over the next ten years, this fashion novelty spread across Europe, as well as across the colonies on the American continent..."
For those who are looking for an authentic Croatian necktie, all roads lead to Zagreb.